Dear Jade Dragon, here are the roses I promised you. But if you want to read the captions on them, you'll have to click on the pale pink rose first, as usual, I uploaded the pics incorrectly :( Please say hi to the Silver Dragon looming behind you :) I took these photos yesterday, and thought they should be posted immediately when they're still fresh. I heard you plant roses in your garden once. Did you know we have an acquaintance who's a good flower photographer? 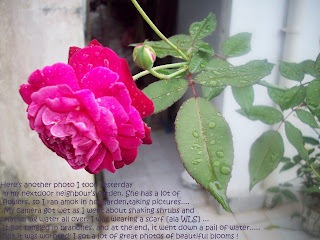 Yep, she loves taking photos of roses. Still don't know who she is? She's Roytavan, a baefamily from Thailand [BYJ has lots of great family members in Thailand]. Of course there are awesome photographers from Korea, Japan and other baefamilies also. the sales assistant said," We have it in our store room, it just arrived. If it is positive you will buy it, I could get it for you now". Wow. it's out...with out thinking, I quickly said YES....and I waited a few minutes till she came back, "Here it is mam, its RpXXXXXX,- ". Yikes !! I forgot to ask the price ! and this was the hard cover edition ! So, after wiping the shocked expression off my face, I followed her to the check out counter. Jade, I did remember to say something to melchan and her brother, " Don't tell papa how much I paid for that book !". They agreed [of course 'why they agreed' is another story all together ! he he he..]. All the way home I was intoning 'Waise heill !....Waise heill !" to my ailing purse...Lots of love to Jade and Silver Dragon from Puff Dragon in her lair. Arta du evarinya ono varda, Jade & Silver vodhr !! 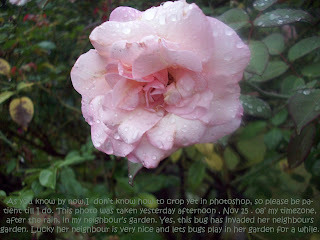 Photos taken in my my neighbor's beautiful flower garden on Sat, Nov 15 08, my timezone. Myoce, is this a good book? Only for children or for adults also? I found it in Amazon so might ask hubby to buy it for me for Christams. Hyds, I think it is a good book. But it depends on what kind of books you like. Paolini's books have been bestsellers. He wrote the first book when he graduated from Highschool, at the age of 15 !! I think it's rated 'G' for general audience. Melchan has read all three.